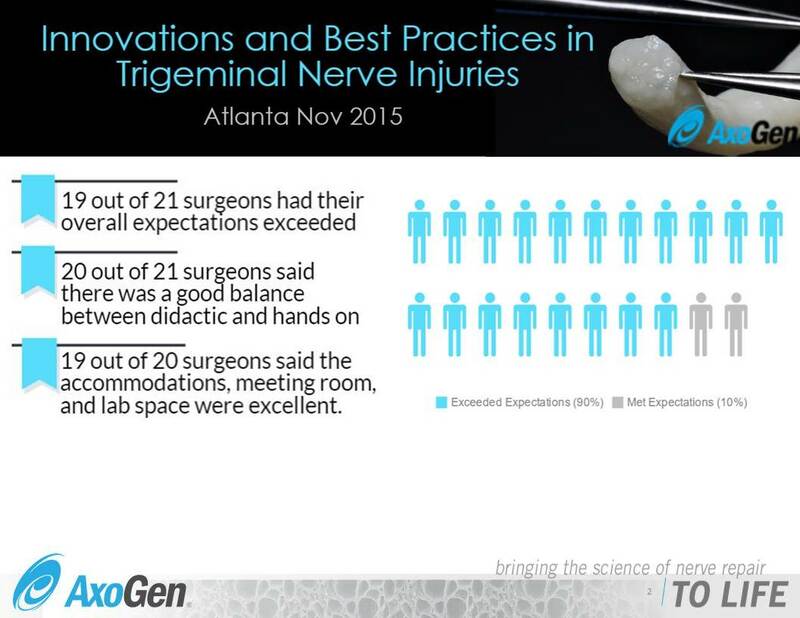 Earlier this month, Dr. Bagheri and Dr. Meyer led an educational program for oral and maxillofacial surgeons on the treatment of trigeminal nerve injuries in Atlanta, GA. They shared technical and procedural expertise through lectures, case studies and procedural videos, as well as interactive panel discussions and surgical demonstrations. In addition, the faculty facilitated a cadaver workshop where participants had the opportunity to practice these advanced surgical techniques as they perform relevant nerve repair procedures. AxoGen, the program sponsor, released the survey results for the course. They asked the participating doctors and surgeons if the course met their expectations and what was the most valuable information they learned. The results revealed that 19 out of 21 surgeons had their overall expectations exceeded. The things the surgeons found most valuable about the program included: hands on experience, world class speakers, a diverse faculty, faculty interaction, and innovative ways to use wraps.